Count Down to Christmas Cheer with the Opulent Infusions Advent Calendar! Opulent, Glittering and Sensational, a merry muddle of festive fragrances, Molton Brown’s Opulent Infusions Advent Calendar is the ultimate homage to Christmas. Behind each of the 24 doors, a tantalising treat awaits - many in full-sizes. 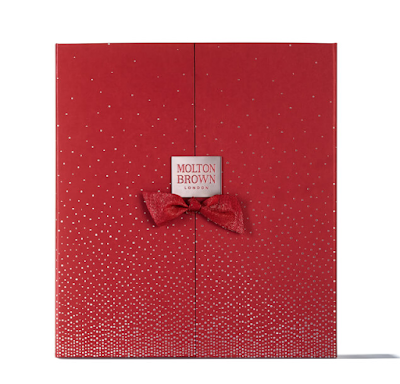 Sealed with splendour, and embellished with sparkle, unlock the iconic metal plaque and shimmering grosgrain knot of Molton Brown’s beauty advent calendar and discover the gifts within. A tasting cabinet of luxurious fragrance infusions, from intoxicating home aromas to presoirée pampering rituals. Make every day of the festive countdown a celebration; the perfect gift for them, a tantalising treat for you. The Molton Brown Opulent Infusions Advent Calendar 2018 Available Now!